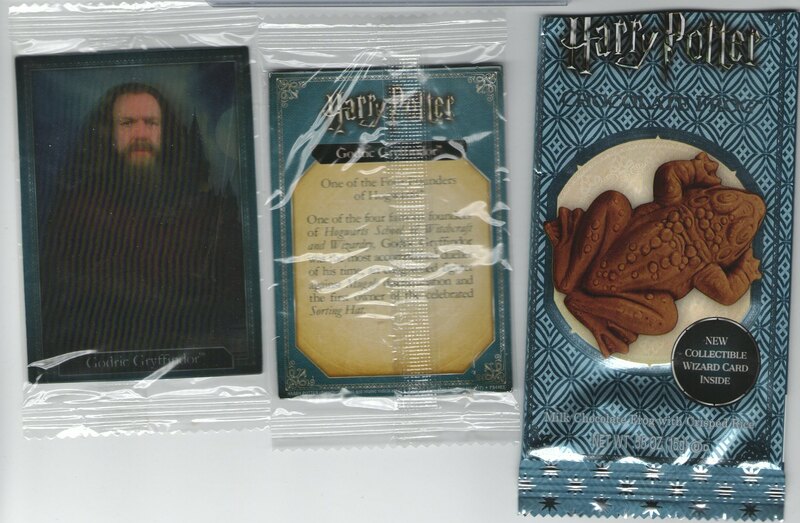 I found some new Harry Potter chocolate frogs with new (dated 2017) wizard cards. The ones I bought were both the same (my usual luck) but from what I've been able to find, there are five cards this time. It seems this time they used actual photographs to make the cards instead of the cartoony style of the previous ones. I couldn't get them to scan very well as I left them sealed but I think you get the idea. Are they 5 sided (pentagon shaped) and nearly 4inches across at their widest part. 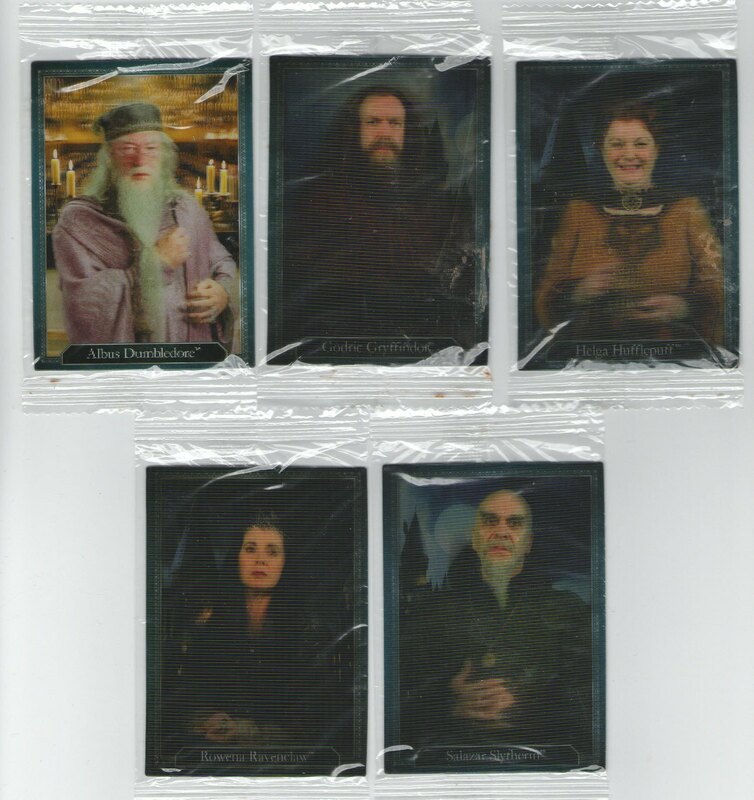 If so I believe there is a sixth card which is Golden coloured as opposed to the Purple colour of these 5 and that they are obtainable only at the Warner Bros studio shop. In the UK at the Harry Potter Studio Tour shop. Also note that according to the card it is Godric not Godrick but that is only a minor point. No, these are regular 2.5 x 3.5 cards. The back of the wrapper states Copyright 2017 by the Jelly Belly Candy Company. hopefully I can get my scan uploaded soon. Thanks Greg, some more cards to look for. Where do you buy those? I'm in Gainesville, FL this week. I went to a Wal-Mart and a Target but didn't see Chocolate Frogs - no chocolate amphibian of any kind. In PA I found them at Five Below. Bought 5 and got all 5 cards. That's a first. I too bought the packs at a Five Below and I got the set of 5 from a seller on Ebay. Okay, I stopped by the Pool Noodle capital of Crystal Lake - also known as 5 Below. Bought 6 packs, didn't think I'd be as lucky as RevJay. Nice cards though. like the photos better than the drawings. Anyone needs a Salazar and has an extra Dumbledore or Hufflepuff, let me know. I don't know what Five Below is but will ask the locals. There is a Books-A-Million near where I'm staying, though. I'll check that out. Picked up a few packs. Like the wrapper, and the photos. Collation is poor. Got two Dumbledore. A bit pricey. I've always wanted to buy these but they're $5 each. Considering you're eating half of what you buy it's rather expensive. They've been out a few years so do they release a different set of 5 cards each year? Or is this the whole set? The first series came out several years ago, artwork is good, all cards are lenticular. This new set with 5 cards is first with photos, also lenticular. I bought the first series at Bookstores, Borders and Barnes and Noble years ago.I recently saw the first series on sale at Barnes and Noble. At the 5 Below in my town, they sell the first series as well as the new ones. Price is$2.99 per pack, not bad to pay for an insert card. Candy is chocolate with rice krispie type cereal added, quite tasty. I did find a pack at the Books-A-Million in Gainesville. It wasn't priced but it must've been less than $3 because I bought it with a $2.25 Sunkist candy pack and I got change from a $5. I gave it to my youngest niece because she's a big Harry Potter fan. I'll look for packs at Barnes & Noble. Thanks for the info, everybody. I did find a pack at the Books-A-Million in Gainesville. It wasn't priced but it must've been less than $3 because I bought it with a $2.25 Sunkist candy pack and I got change from a $5. I didn't see them at a local Barnes & Noble but find a whole box of them at Lolli & Pops, a candy store in Oakridge Mall, San Jose, CA. The packs were $4 each. Anyone in the USA want to trade these? I have an extra Rowena and Salazar and I am looking for GODRIC AND HELGA. I also have a LARGE list of other stuff for trade. Also LOT OF RARE POTTER NON-CARD ITEMS. If u are not from the USA please send me a list of other things u have to trade. I do not mind trading internationally but it would have to be for more than 2 cards to make it worthwhile. I have also included a scan of the packet which states that it is made made Jelly Belly under licence. The sticker has plain back. Apologies for the torn wrapper and again the product is produced by Jelly Belly under licence. John, in News and Rumors up above, I mention this new series. Interesting yours has a blue border, the ones I bought at Barnes and Noble have a white border and I have heard of a purple border on these from a Walgreens drugstore.